To access the secured content, you have to register first. In order to get access to protected content you may state your customer number or an activation code while registering. You can find your customer number on the latest invoice or on the shipping label. 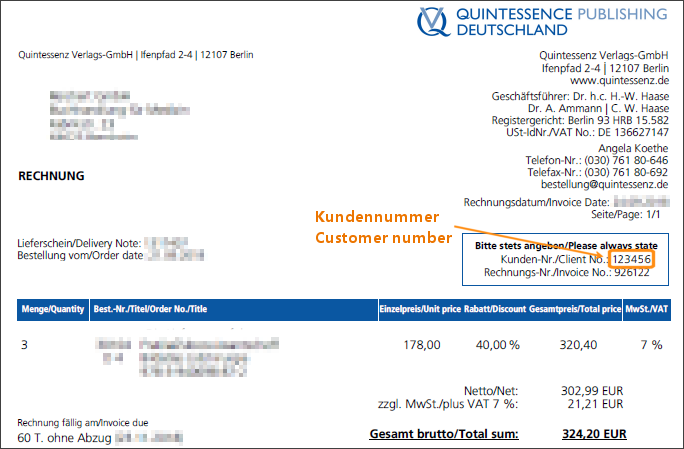 Quintessenz Germany: All customer numbers consist of 6 digits. The suffix "/0" is to be omitted. Quintessence UK: All customer numbers consist of 3 to 5 digits. Leading zeros are to be omitted. Quintessence USA: Customer numbers consist of letters and digits. Please attach your subscriber number to the customer number with a hyphen ("-").If your customer number is "ABC123" and your subscriber number is "1234" you should type "ABC123-1234". In case you retrieved an activation code as a member of a university or society, you may leave the field for the customer number empty. You can add your access rights everytime using the menu item "Access Rights" by entering your customer number or an activation code. Customers of Quintessenz Germany use only the first six digits of the customer number. The suffix "/0" is to be omitted.